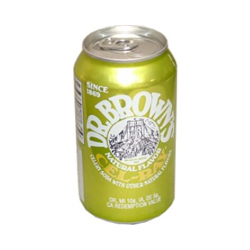 Even now, I can taste the sharp sweetness of Dr. Brown’s Cel-Ray soda. This East Coast drink is my Yiddishkeit version of Marcel Proust’s madeleine, the bite-sized piece of sponge cake that launched seven volumes of Remembrance of Things Past. I promise to be briefer. When I was a child, I did not know that my favorite soda pop—a special treat during visits to the local delicatessen—was based on a nearly 100 year-old recipe. According to its manufacturer, this fizzy, celery-flavored drink was first concocted in Brooklyn, New York in 1868. Then, it was called Dr. Brown’s Cel-Ray Tonic, a reference to its supposed medicinal properties. In 18th and 19th century North America, many fake medicines or tonics were sold as cures or relief that doctors could not provide. Some of these tonics supposedly contained healing herbs or vegetables, such as Dr. Brown’s, while others reputedly contained Native American remedies, such as “snake oil.” In the early 20th century, the new Federal Drug Administration cracked down on claims that “snake oil salesmen” could make about their wares. That is when Cel-Ray Tonic became Cel-Ray Soda—though many people when they first sample this beverage would say that “soda” in no way describes its distinctive taste! My mother and father, though, always humored my childhood requests for this treat. And, many years later, my father even managed a small smile as I held a straw to his lips so he could sip a few drops of family history with me. That would have been close to the end of his unusually long, nine year battle with ALS (Amyotrophic Lateral Sclerosis), also known as Lou Gehrig’s Disease. Like that famous baseball player and many other victims of ALS, Dad had been fit and active. Well into his retirement years, he swam several times a week and retained the lean, strong muscles of a former handball player. But he had begun to walk slowly and sometimes trip on street curbs. The eventual diagnosis of his ALS coincided with my decision to begin writing for children and young adults. My second professional publication in this field was a magazine article titled “ALS—Mysterious Disease of Giants,” drawing upon research I had done to understand what my father was facing. It appeared in a 1995 issue of the science magazine Odyssey devoted to eminent physicist Stephen Hawking, another ALS sufferer. Not surprisingly, Dr. Brown’s Cel-Ray Soda did not cure Dad. Modern medicine also failed him. Years later, after my father’s slow decline, I accepted an invitation to write The Story of Pharmaceuticals for Compass Point Books. Today, Professor Hawking remains perhaps the world’s most famous person living with ALS. His adult life-story is the focus of a new movie, The Theory of Everything. Hawking’s mind shines brightly even as deadened nerves and withered muscles make him dependent on a respirator to breathe, a wheel chair to move, and a computer to communicate. My father, too, remained alert even as his body slowly shut down, and he could not really enjoy that sip of Cel-Ray Soda. Twelve years after Dad’s death in 2002, modern medicine still has not found a cure for ALS, and I am very reluctant to see Hawking’s story on film. I always have some personal reason for the subjects of my books and articles. Sometimes it is curiosity or conviction. Some topics present an intellectual challenge. Sometimes I just want a change of pace or a chance to laugh. With The Story of Pharmaceuticals, I was inspired by a person I loved and a disease I still hate. I dedicated that book to my father, Sam Rosinsky. And this updated essay is a further acknowledgment—not just of Sam’s valiant struggle but of the threads of memory, the bonds of affection and loss, that may be stirred anew by the creative process, itself calling up still more memories. Such marvelous synergy. . . I raise a can of celery soda and drink to that and to Sam! Another salute and swallow for Stephen Hawking and his first wife, Jane, upon whose memoir the filmed Theory of Everything is based. This entry was posted in articles and tagged "ALS: Mysterious Disease of Giants", "snake oil", ALS, amyotrophic lateral sclerosis, Dr. Brown's Cel-Ray Soda, Dr. Brown's Cel-Ray Tonic, Dr. Jane Hawking, fake medicines, Lou Gehrig's Disease, memoir, motor neuron disease, Odyssey magazine, Or Emet Illuminator, Professor Stephen Hawking, Sam Rosinsky, The Theory of Everything, Travelling to Infinity: My Life with Stephen, Travelling to Infinity: The True Story Behind The Theory of Everything. Bookmark the permalink.